As an alternative to performing, Julian the Juggler can run a Circus Workshop! many different Circus Skills. Julian the Juggler offers tuition, guidance and advice as required. See a Circus Skills Workshop in the video below! Turn up the sound to hear the Circus Skills Workshop music. Teambuilding with Circus Skills for your Company or Group. Circus Skills Teambuilding for Teachers. Circus Skills Workshops for Parties. Circus Skills Workshops are great fun (and learning) for Schools, Colleges and Universities too. with learning difficulties and/or disabilities. 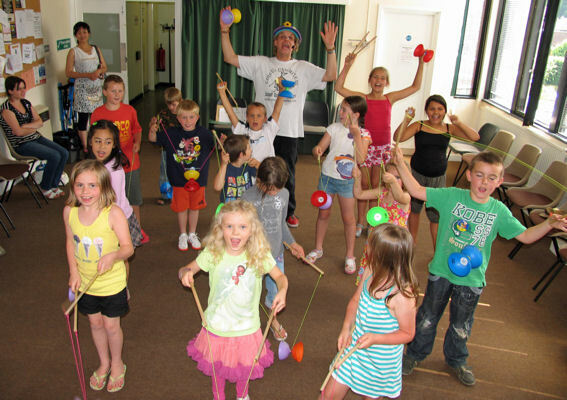 A "Drop-In" Circus Skills Workshop is the best for Fetes, Fairs and Fun Days. Circus Skills are not as easy as they look....and not as hard as you would imagine. and many other Circus Skills too. Circus Skills Workshops are flexible to allow for different preferences and levels of ability and expertise. Everyone learns Circus Skills at a different speed and in different ways. You don't have to be a great performer to be good at (or have fun with) Circus Skills! You can learn as much (or as little) as you want....and at your own pace. The best Circus Skills Workshops are between 1 and 2 hours long. Ideal Circus Skills Workshop group size is up to 30 participants. Other formats are also possible depending on group size, space available and ages involved. If your Circus Skills Workshop is indoors, skills will not be restricted by wind and rain! Say what you need and we'll investigate the options together. Circus Skills are great fun and can be dangerous. We want you to enjoy yourself ....and take care too. and has been CRB checked. All Circus Skills equipment supplied remains the property of CIRCUS UNLIMITED!